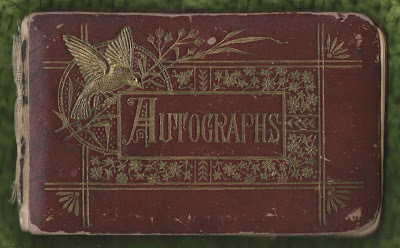 This interesting autograph album appears to have been passed to a succeeding generation, as well as having done double duty as a scrapbook. 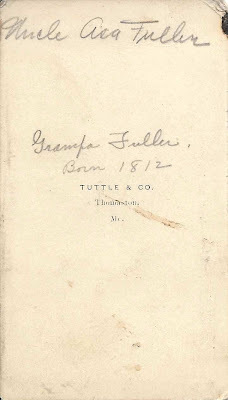 I believe it first belonged to Julia Adelia Fuller and was then passed to her children, perhaps Clarence, as one of the later autographs is inscribed to Clarence, from a Clarence. This was either an Uncle Clarence Dean or perhaps young Clarence Dean to his older self, as it contains a humerous glimpse into the future. 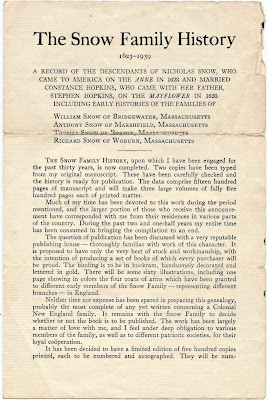 The album contains a four page prospectus for a work entitled The Snow Family History, 1623-1939, by William B. Snow, whose address was 75 Dexter Street, Malden, Massachusetts. Julia Adelia Fuller was the daughter of Asa Coombs Fuller and Mary Jane (Snow) Fuller. Below is the first of the four pages. 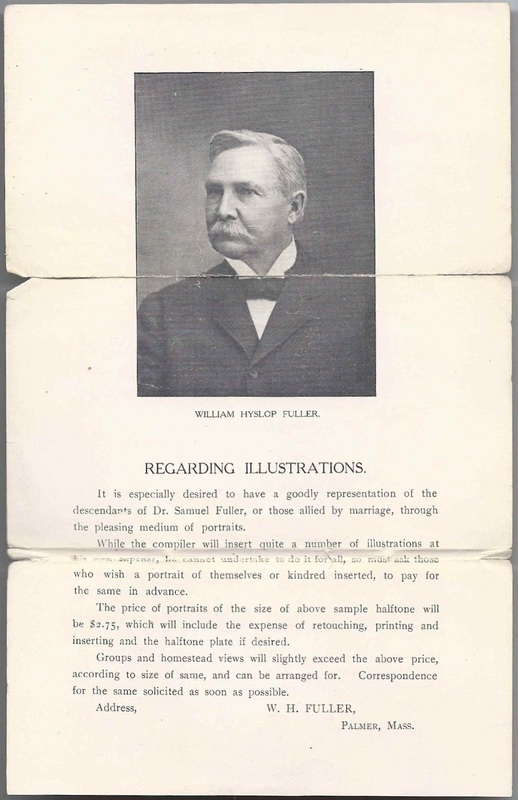 The album also contains a single page with a photograph of William Hyslop Fuller, who apparently wrote a genealogy of the Fuller family and was advertising prints of his photographs of family members. 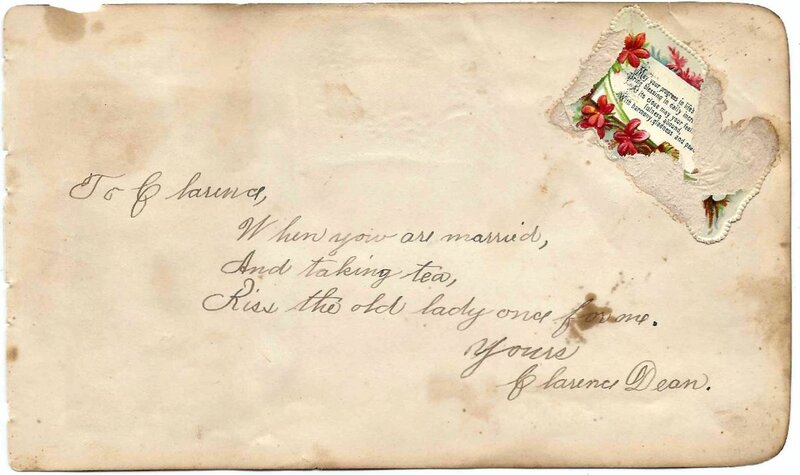 The earliest autographs are from the early 1880s. 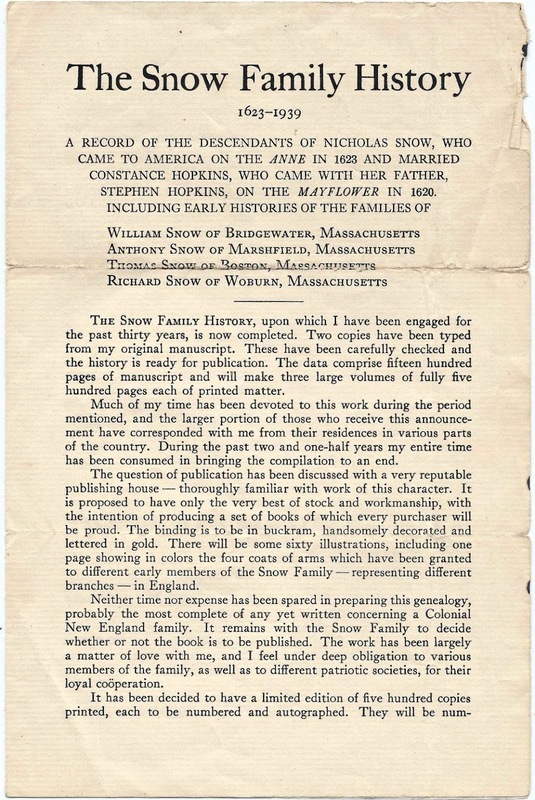 The latest item might be the Snow genealogy prospectus. 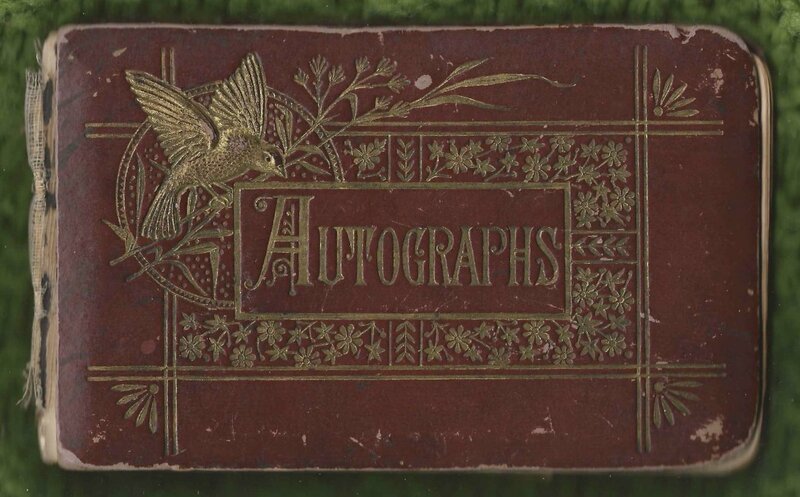 The album is approximately 7" x 4" and contains 17 autographs in addition to ephemera and photographs. An alphabetical list of the signers appears at the end of this post. Julia Adelia Fuller was born 26 January 1855 at Thomaston, Maine, daughter of Asa Coombs Fuller and his first wife Mary Jane (Snow) Fuller. 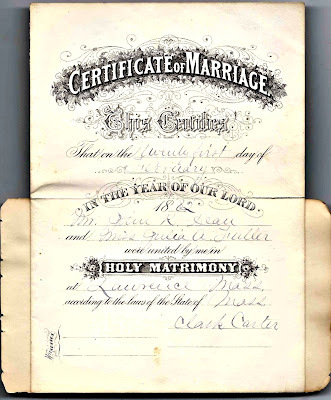 After Mary Jane's death, Asa married Mary Jane's younger sister Anna Baxter Snow. 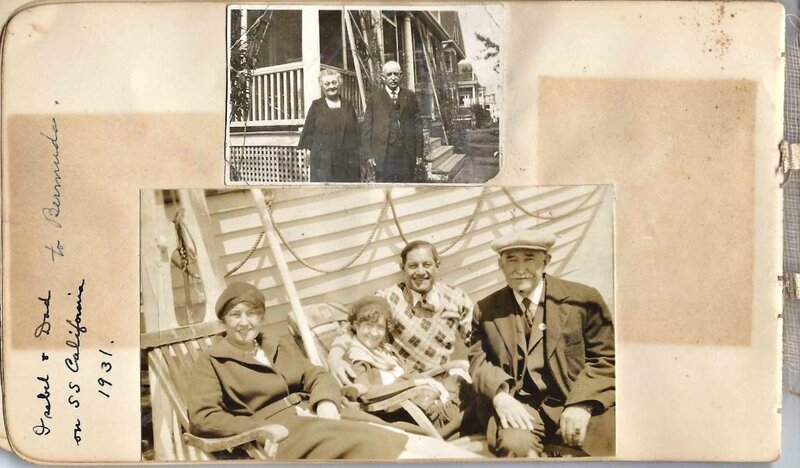 Julia's paternal grandparents were Samuel and Nancy (Hey or Hay) Fuller. Her maternal grandparents were Elisha and Mary (Sawtelle or Sartelle) Snow. Walter E. Dean, born 25 January 1893; an enclosed clipping shows him in his 1918 military uniform; m. Kathyrn Louise Cragin, "Kit"
Wedding of Miss Frances Ruth Burtt to Walter E. Sweeney. Clipping that describes a series of accidents on an icy stretch of road involving cousins Isabelle Dean and Frances Burtt, who were lucky to escape unharmed. 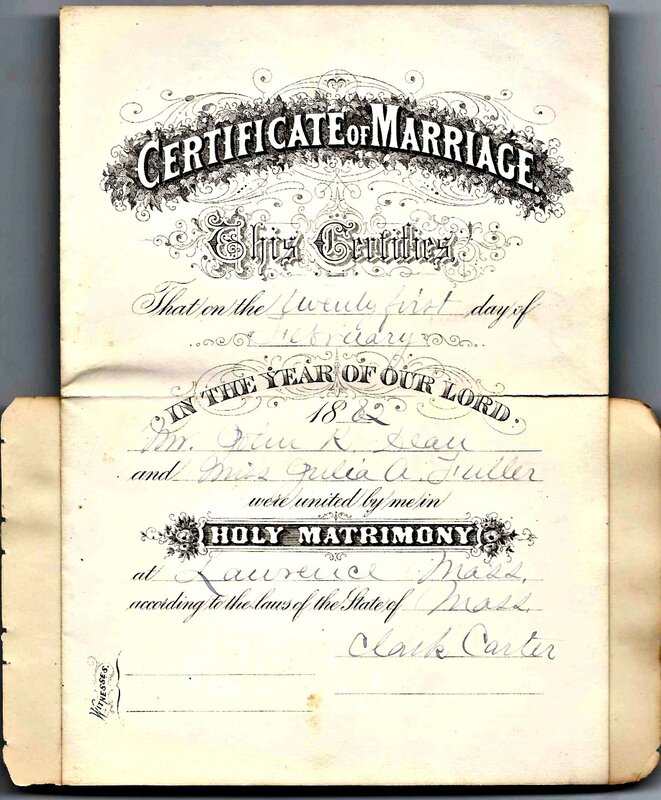 Also included was the unofficial marriage record of Julia Adelia Fuller and John R. Dean, dated 21 February 1882. 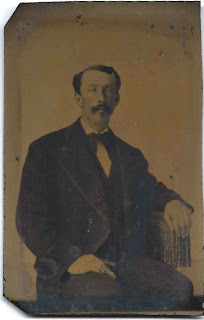 John R. Dean was the son of Thomas and Margaret (Moore) Dean. 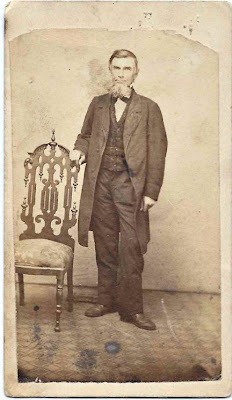 In addition to the CDV of Asa Coombs Fuller, three other photographs were pasted into the album. 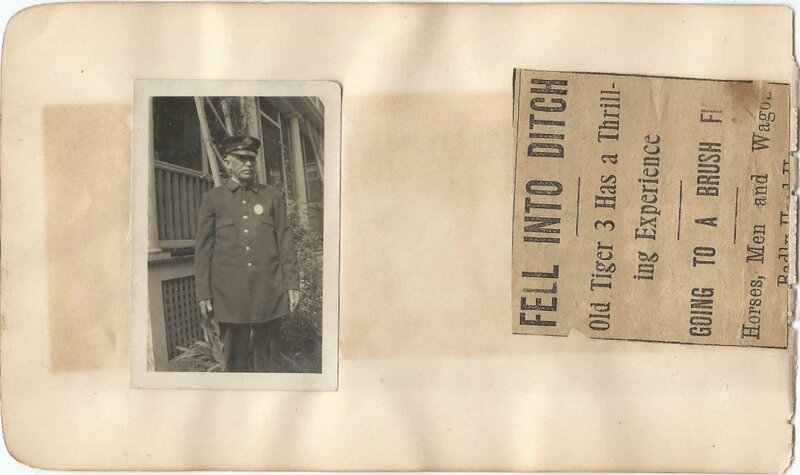 Several others items, including clippings from magazines were also pasted in the album. If you have corrections to the information above or additions to it, or information on any of the people, listed below, who left autographed pages in the album, please leave a comment or contact me directly. Thanks! Clarence Dean, to Clarence. 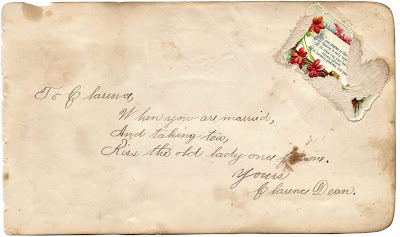 Possibly an uncle to Clarence Dean or a message signed by young Clarence to his future married self. "When you are married, and taking tea, Kiss the old lady once for me." Walter E. Dean, son of John R. Dean and Julia Adelia (Fuller) Dean. 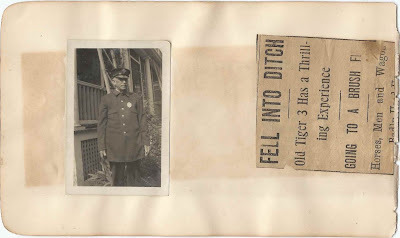 A newspaper photograph of him dated 1918 in what appears to be his World War I uniform is pasted on the page. Another page has two of his colored illustrations. Anna B. Fuller of Lawrence, Massachusetts. "Your mother". 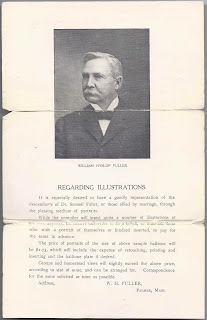 Assuming this was directed toward Julia Adelia Fuller, Anna Baxter (Snow) Fuller would have been Julia's step mother and aunt, as Julia's mother, Mary Jane (Snow) Fuller, first wife of Asa Coombs Fuller, was Anna Baxter (Snow) Fuller's sister. 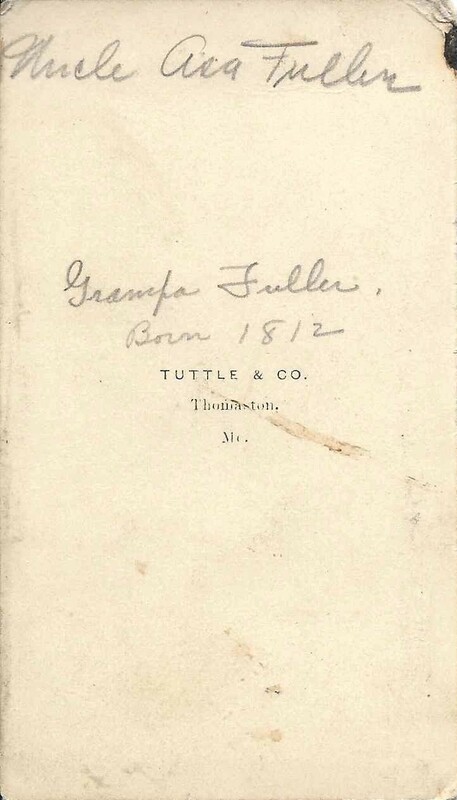 Mark I. Fuller of Lawrence, Massachusetts, signed 29 January 1882 or 1892 [strikeover]. The page also has the concluding paragraphs of a newspaper clipping about the funeral of Mark's older half sister, Julia Adelia (Fuller) Dean, Mrs. John R. Dean, of Lawrence, Massachusetts. The previous image contains the beginning of that newspaper item. 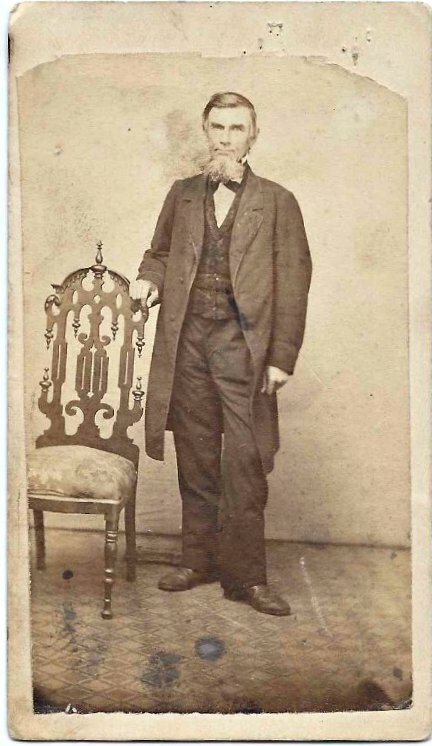 John S. Snow, signed on 29 January 1882. 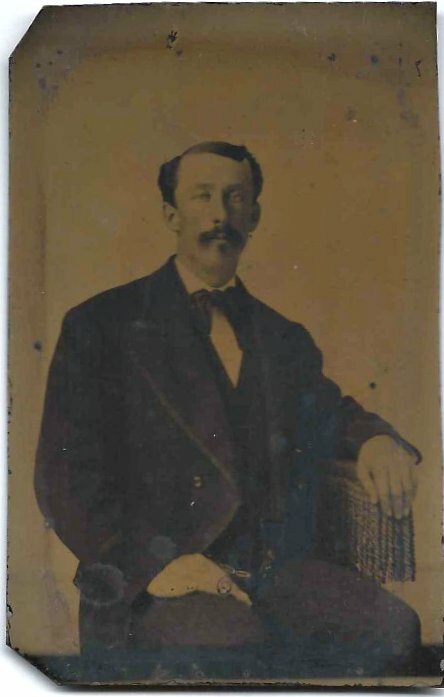 He may have been the John S. Snow who was a brother of Mary Jane (Snow) Fuller and Anna Baxter (Snow) Fuller. I loe looking at these old books. Thank you again for this blog and for posting all these treasures! 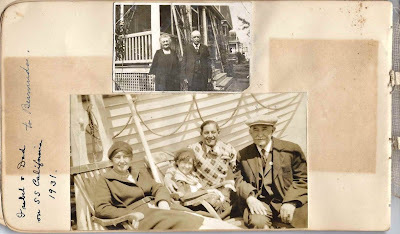 I sent a link to this particular posting to a 4th cousin of mine who has the Snow family in her genealogy. BTW, I lived for several years in Salem, NH back in the late 50s early 60s when it was still know as Salem Depot. My father was Assistant Manager of the Sears store in Lawrence and I was a member of the Lawrence YMCA for a few years. I used to go into work with my Dad on Saturdays and he would drop me off at the Y, which was just across a small city park from the Sears store, I'd meet him for lunch and then drive home with him after a day of swimming, games and movies. Good times, good memories! Thanks for your kind comment, John. I remember going to Lawrence years ago to visit a man who was a dedicated amateur archaeologist, with a special interest in Maine, where he summered on Cobscook Bay. His collection is at Peabody Museum, I think.